Palatine tonsils are lymphoid tissue masses allocated between anterior and posterior pillars of oropharynx. These are two in number and are vascularized by various arteries which include facial artery (tonsillar branch), external carotid artery (ascending), ascending palatine, lingual artery (dorsal linguae) and maxillary artery (descending branch). Moreover, certain veins and lymphatics also drain into this structure. These tonsils play significant physiological role in provision of local immunity and various surveillance mechanisms in human body. Acute tonsillitis is a condition in which both the pharyngeal tonsils and the pharynx is inflamed. It is majorly classified into four categories. 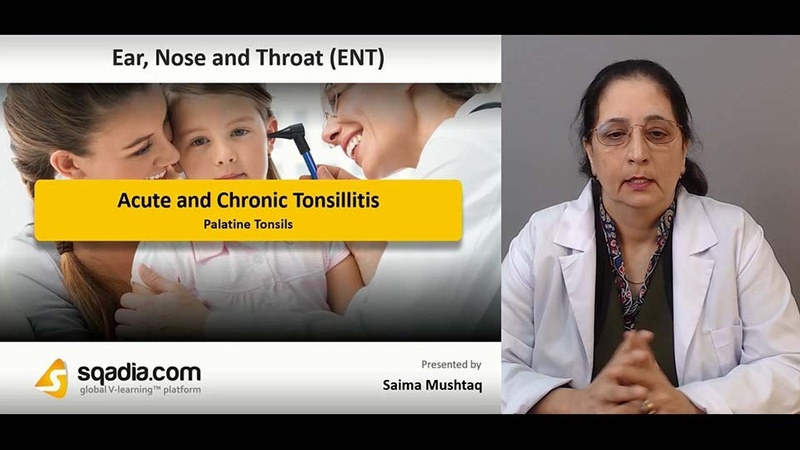 These being acute catarrhal, follicular, parenchymatous and membranous tonsillitis. The prime causative organism responsible for this illness is Haemolytic streptococcus. It presents with various signs and symptoms which include; sore throat, dysphagia, red and swollen tonsils along with certain constitutional symptoms. Rest, fluids ingestion, intake of analgesics and antimicrobials form a part of the treatment strategy. An acute specific condition entitled faucial diphtheria presents with certain complications (myocarditis, diaphragm paralysis). It is treated with an IV infusion of antitoxins and by the intake of antibiotics. There are a range of conditions which are included under the broad category of acute tonsillitis. Each has its own clinical presentation and can thus, be diagnosed in a way specific for each malady. These include agranulocytosis, leukaemia, atrophic and traumatic ulcers in addition to candidal infection of tonsils. Diagnosis in general, includes various tests like biopsies, Paul-Bunnell or mono spot test. This, relatively severe, condition has been attributed to by various aetiologic factors. 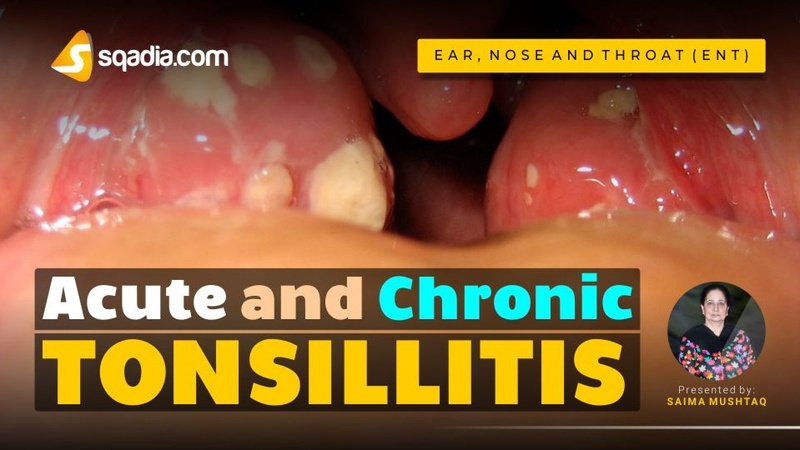 These encompass microabscesses walled off by fibrous tissues, can either be a complication of acute form or can be due to chronic infection in sinuses or teeth. It has primarily been classified under three types viz chronic follicular, parenchymatous and fibroid tonsillitis. It presents with explicit features (sore throat, cough, halitosis etc). A conservative strategy (healthy diet) can either be adopted in addition to treatment of coexistent infections along with tonsillectomy. This condition leads to a variety of complications which can be eye, skin disorders, rheumatic fever, cysts etc. Acute lingual tonsillitis gives rise to unilateral dysphagia and feeling of lump in the throat. It presents with lingual tonsils enlargement and congestion. It is treated by a course of antibiotics. Another condition entitled Hypertrophy of lingual tonsils is a compensatory hypertrophy of lymphoid tissue in response to recurrent infections in tonsillectomized patients. It is treated via diathermy coagulation, excision, and laser surgery. Moreover, there are abscesses of lingual tonsils as well. It can follow acute lingual tonsillitis. Clinical features of this ailment include unilateral dysphagia, excessive salvation, trismus and laryngeal oedema. Treatment approach for this comprises of antibiotics and analgesics doses accompanied with hydration and incision of abscesses thus formed.